Our letter this year is a bit different than the one we’ve had for our first two campaigns with the (official) addition of our firefighting friends! If you are reading this, then you have heard what hundreds thousands of us are up to. AGAIN! In December 2014, there was a single idea to send cookies to a single sheriff’s office in the Northern Kentucky area. This idea came following the increasing frustrations from the negative news coverage that seemed to never end. In just 2.5 weeks, we were able to take this single idea for a single department and expand to deliver 30,000 cookies to 220 departments in 24 states on December 22nd (and the week of). This campaign was such a huge hit that we turned it into an annual event (moved to October) as a way to flood departments across the US with kindness, something so easily lost in society these days. 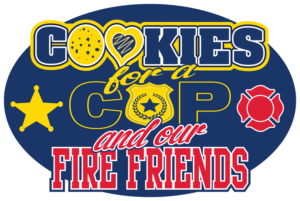 Our 2015 event delivered over 116,000 cookies to departments in 28 states! Our founder’s roots come on the fire side of this coin. Born into the fire family, she grew up visiting her father at the firehouse and playing on the trucks. Now grown, her brothers have also taken the path of civil service with the City of Cincinnati; one as a firefighter and the other as a police officer. She also has an uncle who serves as a City of Cincinnati firefighter so adding RED to the mix only seemed the obvious progression and a natural fit. Our deliveries will take place October 10th, 2016 (or the week of for those unable to deliver on that date). Every leader must show ID. You may personally know your leader – this is a bonus. Because some of our leaders have opted to expand out more, you may not know the leader who may be related to an officer or firefighter in a neighboring community. We have asked our leaders to let you know their connection to law enforcement and / or firefighting and answer any questions you may have for them. Our leaders are to invite you to keep a copy of their ID for your records. Every delivery will have a label attached to indicate that it is a part of this project. These labels will also list your leader. This leader name should match the name on the ID presented. Our leader list will give first name, last initial (for security and privacy reasons we have opted for initial only). Being family (and knowing so many others in these professions), you can be assured that we understand some concerns that may come with this type of campaign.